During a time of economic downturn and uncertainty, leaders are needed in all sectors of society to foster innovation and progress. Three times a year, the Women of Color luncheon recognizes female pioneers in certain fields, and these women share personal stories and lessons gleaned from their respective fields. 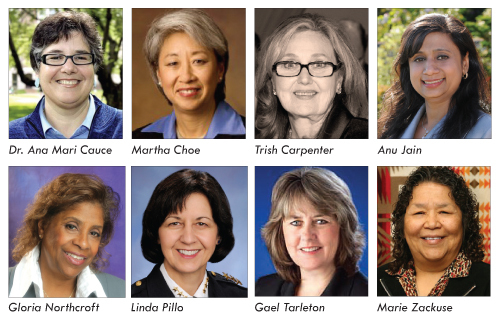 The upcoming Women of Color Empowered luncheon will take place on May 11 at the Westin Bellevue, and the theme is “Today’s Leaders.” The honorees of this upcoming luncheon come from various fields — from education to law enforcement — each with the goal of shaping a better tomorrow. Dr. Ana Mari Cauce is the recently appointed provost and executive vice president of the University of Washington. She has held many faculty and administrative positions at the UW, and she maintains an active research program in adolescent development, with special emphasis on at-risk youth. She has also been active in work encouraging women and minorities to pursue careers in science, technology, engineering, and mathematics. Cauce’s family fled Cuba when she was very young, at the start of the Cuban revolution. While she was a graduate student in the U.S., her older brother was murdered at an anti-Ku-Klux Klan rally. Her family’s hardships lent to her dedication to provide opportunities for students and youth. In addition to her role at the university, Cauce dedicates herself to many projects, working with the homeless, disadvantaged, and minority youth in the area. Martha Choe serves as chief administrative officer of the Bill and Melinda Gates Foundation, overseeing the foundation’s information technology, security, and site operations teams. Choe joined the Bill and Melinda Gates Foundation in 2004, as part of the foundation’s Global Development Program. She also served as chair of the White House Commission on Asian American and Pacific Islanders and as director of the Washington State Department of Community, Trade and Economic Development, providing leadership for sustainable job growth in Washington State. Trish Carpenter is the president of Bellevue LifeSpring, a non-profit organization promoting stability, self-sufficiency and independence for those in need in the Bellevue community. Carpenter recently represented Bellevue LifeSpring in receiving one of two 2011 Community Treasure awards given by the Bellevue Downtown Association. Anu Jain is the vice-president for community relations at Intelius, shaping the company’s policies on community outreach and charitable giving. Jain has been a leader in supporting activities and causes for women. She recently participated in the Women’s Forum Global Meeting, where participants discussed strategies to place more women throughout corporate hierarchies. Gael Tartleton, two-term Seattle port commissioner, is the third woman ever elected to the Port of Seattle. After graduating college, Tarleton got her start as a senior defense intelligence analyst for the Pentagon. Locally, Tarleton co-founded the University of Washington’s Citizen Roundtable on Politics and Democracy and the Northwest chapter of Women in International Security (WIIS). She was also a research analyst at the Defense Intelligence Agency and a policy director for at the National Bureau of Asian Research in Seattle. Last month, Tarleton announced her candidacy for an open seat as state representative for the 36th District. Gloria Northcroft is an executive in the bio-pharmaceutical industry with over 20 years of recognized leadership and professional experience. Northcroft was a senior clinical specialist at Genentech, Inc., where she focused on innovative therapies for patients with life-threatening medical conditions. She is currently on the governing board of trustees for Seattle Children’s Hospital and chair of its Audit and Corporate Responsibility Committee. Northcroft has volunteered in civic and community-oriented organizations working with local youth organizations and schools. Northcroft and her husband were recognized as Bellevue Citizens of the Year for their work in the community. Linda Pillo is the current chief of police for the city of Bellevue. Pillo became the first female police chief for the Bellevue Police Department in 2008, after working 22 years for the department. She began her career as a police officer on Mercer Island, and she has served in the law enforcement field for more than 30 years. The Women of Color Empowered Luncheon will take place on May 11 from 11:30 a.m. to 1:30 p.m. at the Westin Bellevue. For more information or to buy tickets, visit www.womenofcolorempowered.com or e-mail rsvp@nwasianweekly.com.